Margot at the Wedding, the 5th theatrical feature by writer/director Noah Baumbach, has almost evenly divided the nation’s critics - with a 56% positive rating on Rotten Tomatoes. As a fan of Baumbach’s last film, the savagely brilliant divorce drama The Squid and the Whale, I had high expectations going in. And while Margot may not be as deep or as fully realized as Squid and the Whale, Baumbach’s flair for dialogue and keen observation are still in top shape. The film centers around Margot, an emotionally distant and self-centered author returning home with her son for her sister's wedding, and a stay with her highly dysfunctional family. 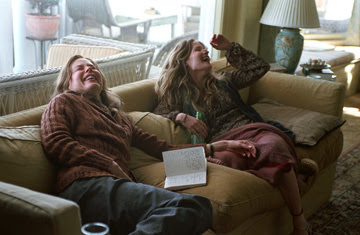 Her sister (Jennifer Jason Leigh) is marrying a shiftless lout (Jack Black) who is a child trapped in a man’s body, and a constant source of disgust to Margot. Along for the ride is her son, who Margot treats more like a companion and object of amusement, and is most affected by her whims. 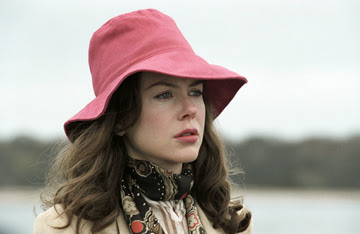 As a character, Margot recalls Jeff Daniel’s pompous writer from The Squid and the Whale in the way she constantly criticizes those around her, seemingly unaware of her condescending nature and the effect it has on others. But her cynicism is less pointed and pretentious than Daniels’ - Margot seems more internally wounded and conflicted, and as a result constantly takes her emotional distress out on her son, instead of using him as a pawn as in Squid and the Whale. Many find Baumbach’s films unpleasant because his characters tend to be highly self-centered and unintentionally cruel, and Margot at the Wedding is no different. Everyone on screen is often despicable - but they are a fascinating lot. They’re like ants under a microscope, aliens from a dysfunctional planet. This is more true of Margot than of Squid…there is less to connect to here on a personal level. But you can’t help but feel for Margot, and especially her son, who forms the film’s emotional core. He is the film’s one likable character, and through our caring for him, we come to care for Margot, as exasperating as she may be. She is a woman who simply does not know how to love, and if nothing else, for that reason alone, she illicits our sympathy. Dysfunctional family comedies are a dime a dozen, but Baumbach’s are wittier, stronger, and more original than most. This is the darker, less precious side of a Wes Anderson film. It may be too early to give Baumbach the title of auteur, but his films have an unmistakable style and a clear, unique voice. He creates razor-sharp, darkly funny comedies that play out like dramas. Margot at the Wedding is about people who are the very definition of emotional train wrecks, and it’s impossible to look away.